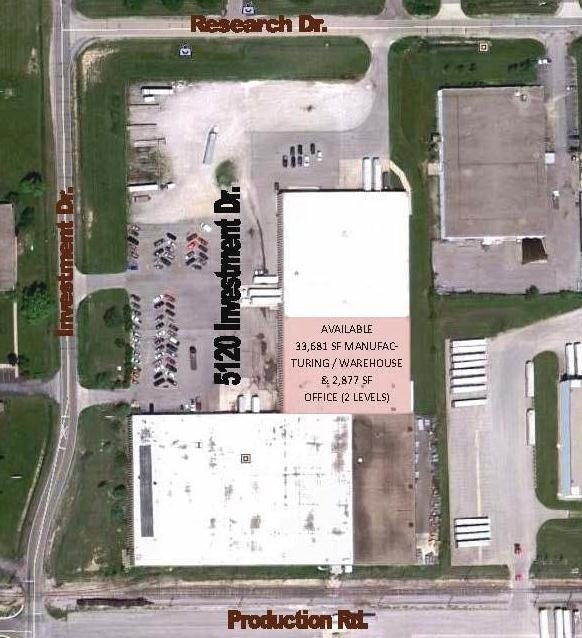 Detailed information about industrial property which situated in Fort Wayne (46808) city, Indiana state on 5120 Investment Dr.
Additional Information: Part of a 187,409 sq. ft. industrial building. The available suite includes 33,681 sq. ft. manufacturing/warehouse space and 1,575 sq. ft. office on the first floor as well as 1,302 sq. ft. office on the second floor. Clear ceiling height is 17'9" to the beams. The building is wet sprinklered. The office is heated by GFA and the warehouse by suspended gas units. There are two dock doors. The property has an asphalt and stone parking lot. Zoning is IN2. The property is located in the Interstate Industrial Park in the northwest quadrant of Fort Wayne. It is approximately 1.5 miles from I-69. NOTE: Please contact with Steven K. Zacher if you want to get more accurate details about pricing and availability of industrial property For lease. All information about industrial property For lease that located on 5120 Investment Dr, Fort Wayne, IN 46808 was obtained from reliable sources, but we cannot guarantee that all data about pricing, details of the building and property was completed without error or has not been changed without notice or withdrawal without notice. If you want to get complete and actual information, please contact with agents.